King Philip has tasted victory at Gillette each of the last two years. Will the Warriors raise another trophy Friday night? The MIAA High School Football season has officially reached its final days with Super Bowl weekend upon us and set to unfold over the course of Friday night and all day Saturday. On Friday, Nashoba will try to win its fourth state title since 2010 when they take on red hot Dighton-Rehoboth in the Division 4 Super Bowl. That will be followed by what could end up being the best game on the slate with King Philip going for a three-peat versus North Andover. Saturday is one of the best days of the high school sports season with six Super Bowls scheduled to be played. Now, for our Super Bowl picks! Feld's Pick: Many have taken Dighton-Rehoboth way too lightly over the course of its playoff run, but Nashoba's combination of speed and physicality is too much for any team in Division 4 to handle. Parello's Pick: In the state semis, for the first time ever, I took an Eastern Mass team over Nashoba... I don't know what I was thinking. Can you ever forgive me, Chieftains? 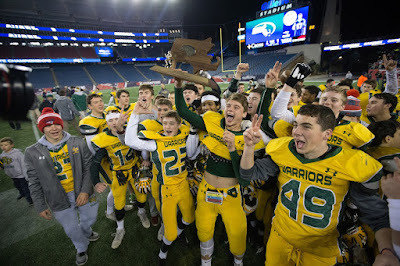 I won't be making that mistake again, as I've got Nashoba taking home its second state championship in four years, further cementing its status as one of the state's best football programs, regardless of division or geography. Feld's Pick: A few years ago, I learned my lesson - never count out King Philip. North Andover has been extraordinary this year, overpowering the competition on a weekly basis. They have speed and athleticism all over the field, and maybe that proves to be too much. But I am going with my gut, which tells the Warriors throughout this run have found a way to win. Teams are ill prepared to match up with their physicality, and Ryan Halliday will carry the ball 40 times if necessary. They refuse to get rattled by the opponent, and the 10 minute quarters will play a pivotal role. The secondary snags a key interception, Robert Jarest steps up, and King Philip tops off this run with a third straight crown. Parello's Pick: Let's be real: I have to pick against Matt just to try and make up a few games against his insurmountable lead. I gotta save a little face. Anyways, if there was ever a team to ride with against Feld's gut, it's this high-powered North Andover group. Despite the short quarters, and King Philip's experience on the field and sideline, I'll go with Jake McElroy to deliver the goods, and bolster his case to be our Player of the Year. Feld's Pick: St. Bernard's has been absolutely rolling, and while I am enamored with Pope John's sophomore backs in John Smith Howell and Greg Smith, the Bernardians have too many weapons to keep up with. Parello's Pick: Dang it, you're snagging all my CMass picks! But I can't bet against the Bernardians, so I'll bet on the talented one-two running back punch of Walter Morales and Xavier Marty to deliver a state championship. Feld's Pick: St. Mary's is one of those teams that is seemingly at Gillette Stadium every single year. No matter what, they find a way. Blackstone Valley Tech, however, still has a bitter taste in their mouth from last season's close loss to Mashpee. J.D. Antaya and company get it done this time around. Parello's Pick: Again! What, did you move to Worcester since we last spoke? I said on our podcast earlier this week that I might take BVT if they were playing the Patriots this week, so I guess I can't well pick against the Beavers now. It won't be easy against an experienced St. Mary's squad, but BVT's defense and special teams help them grind out a title win. Feld's Pick: In what will ultimately come down to Scituate's high powered offense versus Nipmuc's stingy defense, the Sailors simply have too many playmakers all over the field. Max Roche has a big game, Will Sheskey does his part on the ground, and Aidan Sullivan puts a cap on his football career by leading Scituate to its first Super Bowl crown. Parello's Pick: Aidan Sullivan is another one of our Player of the Year candidates who seems poised for a big day, but if I'm going down, I'm going down with the CMass ship. If Nipmuc can play ball control behind its physical offensive line and running back Richard Broni, why can't it's play making defense generate a stop or two? After all, these are only 10 minute quarters? And yes, I'm aware that I am now using the exact opposite logic I used when I picked North Andover over King Philip. Sue me. Gimme Nipmuc, as the Warriors join BVT in brining a trophy back to Pleasant St. in Upton. Feld's Pick: The toughest game to pick, with both teams possessing strong running games and physical fronts. In a game that goes back and forth - and also flies by - Billy Garcia is the difference that gets Old Rochester over the top. Parello's Pick: Well... After watching Hudl footage of both these teams for the past twenty minutes, I have decided that I cannot make an educated guess, so I'm just going to pick against you. That said, it looks like it's gonna be a slobber knocker. Feld's Pick: Tewksbury's bruising schedule has it ready for this matchup, with the Redmen facing high caliber teams including North Andover and Duxbury that are akin to Springfield Central. The physical Redmen keep it competitive, but Springfield Central possesses both toughness and athleticism that no one in Division 3 can stop this year. Parello's Pick: Two high-powered, battle tested teams that can score points, and generate stops/turnovers when their defenses are flying around. There will be a lot of speed on the turf at Gillette, and in the end I see Springfield Central becoming the first Western Mass team to capture a state-wide football championship. Feld's Pick: Two weeks ago I would have said St. John's Prep. After Thanksgiving I would have switched to Catholic Memorial. All season long I have been adamant in my thinking that St. John's Prep is the best team in Massachusetts. While they missed out on a Catholic Conference title, they rebound with Matt Crowley having a big night and its defensive front coming through with a handful of sacks to keep a high-motor Catholic Memorial offense at bay. In a classic, the Eagles by a nose. Parello's Pick: Do I even have to say it? I've been on the CM bandwagon all year, and I ain't jumpin' off now. In a back-and-forth affair, the Knights find a way to generate a late turnover and capture the crown.